As power utilities strive to improve the reliability of electricity delivery and become eco-sustainable, microgrids are gaining in popularity. 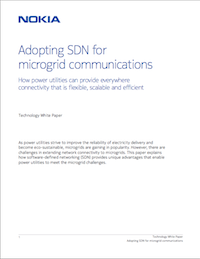 However, there are challenges in extending network to microgrid communications. In order to enhance microgrid communications, the technology SDN is being used as a new way to communicate with microgrids. Software-defined networking (SDN) is a new way of building and operating networks that delivers better end-to-end control, automation and service agility. Evolved from the classical WAN model in which the control and data plane are integrated in a network element, with SDN the network's control and data planes are separated physically. The control plane function resides in a centralized platform called the SDN controller, equipped with an open, northbound API. The network is now programmable, allowing other applications to programmatically control and monitor the network though the SDN controller. With the help of this technology, microgrid communications will be greatly enhanced.